Increases ATP following intense exercise. Facilitates recovery of myocardial contractility following ischaemia. D-ribose, a carbohydrate found in every living organism, facilitates production of ATP. This five-carbon sugar is an essential component not only of ribonucleic acid but also of important molecules such as ATP (adenosine triphosphate) and all nucleotides. ¤ It has a particular role to play in the regulation of energy production. Most of the body's tissues, including the heart, are unable to produce ribose quickly enough to restore energy levels once they have fallen significantly. ¤ In studies of both healthy athletes and individuals with cardiac muscle damage, supplying D-ribose to tired muscle cells rapidly restored ATP to normal levels. By helping to quickly restore exhausted energy reserves, D-ribose may be particularly beneficial for people with cardiac or other problems characterised by inadequate energy production. ¤ Intense exercise, muscle ischaemia or localised hypoxia can all overwhelm the renewal mechanisms of cellular energy. As a result, an imbalance occurs between energy supply and demand which leads to a cascade of reactions and a loss of cellular energy, and eventually, to a wide range of physiological problems including muscle stiffness, pain, weakness, cell damage and decreased levels of protein synthesis. 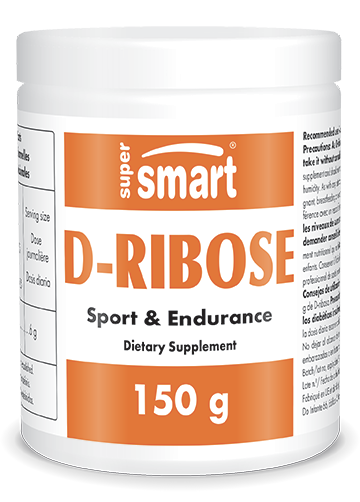 D-ribose helps maintain optimal levels of cellular energy and reduces the physiological consequences of a deficiency of cellular energy. in patients with coronary artery disease, it boosted diastolic cardiac function, increased tolerance to exercise and improved quality of life; these benefits are due to its role in increasing cardiac energy reserves which have been depleted as a result of ischaemia or hypoxia associated with coronary artery disease.